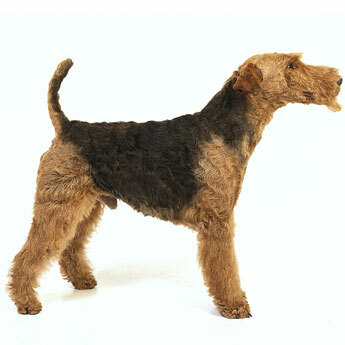 The Airedale originated in England as an all-around working dog, hunting small game and guarding homes. It’s easier to list what an Airedale can’t do than what they can. With a high activity level, the breed needs intense and regular exercise. Uses today: Hunting, working, obedience, agility. Colors: Black and tan with possible red. Grooming: Brush daily. Clip every two months or hand strip three times a year. Coat: Hard, dense, and wiry with a soft undercoat. Sensible home guards, Airedales are protective but generally willing to accept newcomers once their families welcome the newcomer inside. Underneath a tough exterior the Airedale Terrier has a sweet but dignified nature. It is loyal and protective toward its family, reserved with other people and dogs. It’s easier to list what an Airedale can’t do than what they can. Excelling in protection, agility, obedience, and rally – the only thing an Airedale won’t do is sit around doing nothing. With a high activity level, this dog breed needs intense and regular exercise, and if possible, a good sized, fenced backyard. This feisty, athletic dog likes plenty of exercise and responds best to firm, consistent positive training. 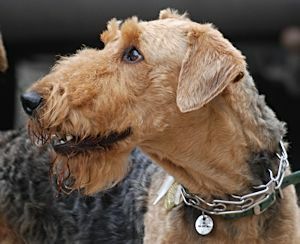 Generally good with children, the Airedale is a strong, high-spirited breed, so supervision is wise, especially around smaller animals, including cats. Wary of new dogs at times, the breed thrives with socialization. The Airedale’s trainability is high, so long as owners navigate around their independence and self-assuredness.